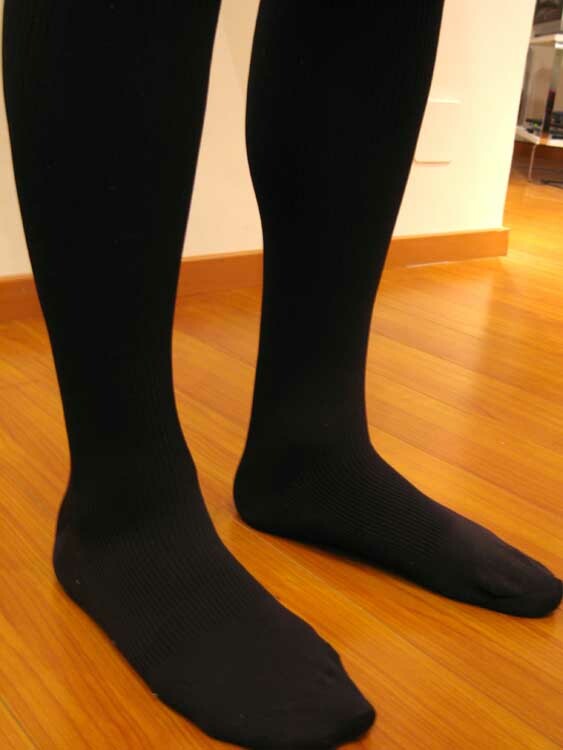 The magical foot coverings pictured here are really compression garments in disguise as ordinary cotton socks. They squeeze your little ankles, getting progressively looser as they run up your calf. We decided to experiment with them on our return trip to the US, and needless to say, we were very impressed! Before: When we flew to Buenos Aires in October of 2008, I was 4 months into my recovery from ACL replacement and other clean up on my right knee. Not surprisingly, my right ankle and foot were Michelin Man-esque by the time we arrived in BA. Tough to get the shoes on. Stiff and swollen. After: Fast forward 9 months to my trip home with the handy dandy travel socks — nada, nothing, zip, zero. Not really any detectable swelling at all. My feet fit in my shoes completely normally at the end of 24 hours of traveling. So run, don’t walk, to your nearest store and buy some travel socks if you have a long car/boat/train/plane trip planned. They are truly amazing. This entry was posted on Monday, August 24th, 2009 at 7:21 pm. You can follow any responses to this entry through the RSS 2.0 feed. You can leave a response, or trackback from your own site.